This Rumble ended on 2003-03-08 00:00:00.0. Sidekick: A senile old man in mouse colored robes. Favorite Quote: "You can die quickly or you can die slowly... but you will die. Oh wait. Did I say die slowly? Just kidding." Is the glass half-empty or half-full? : That depends on the critic. Describe where you live? : Somewhere between Chaos and Creation. The High God of DragonLance looked down upon Krynn and saw that it was good... except for a small black spot. Looking closer he saw a mortal of incredible power defeating every challenge and selling more novels than any other character on Krynn. Frustrated with the magnitude of power this puny human held over his creation the High God stepped down into Krynn and had a word with Raistlin. "Enough is enough already! I have sat by and watched you wield power as though you are some type of god! And while I am impressed by your power, cunning and marketability I find this unrelenting incessant winning to be quite bland. You overshadow any and all beings you are put up against, and it is ruining the fun for everyone. Where is the challenge? The struggle? The unpredictability? Bah... Let us find out if you feel you have become more than a mere mortal. Let us truly discover if the pen is mightier than the spell. 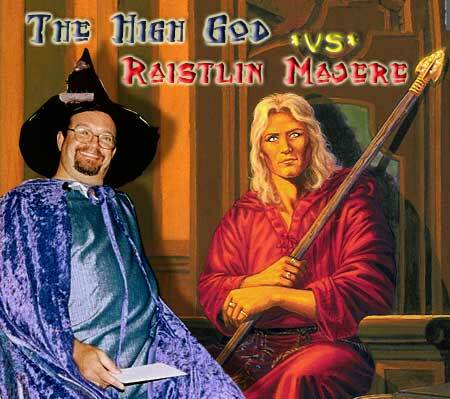 Which magic is greater Raistlin? You're hold over DragonLance Fandom or my ability to erase you from existence? "I have beaten the Gods before you know," Raistlin whispered. "Plus, I have the backing of Wizards of the Coast and name recognition among fantasy circles of which could only dream of. I can not be beaten. It's just that simple." "Bring it on..." Raistlin says confidently.